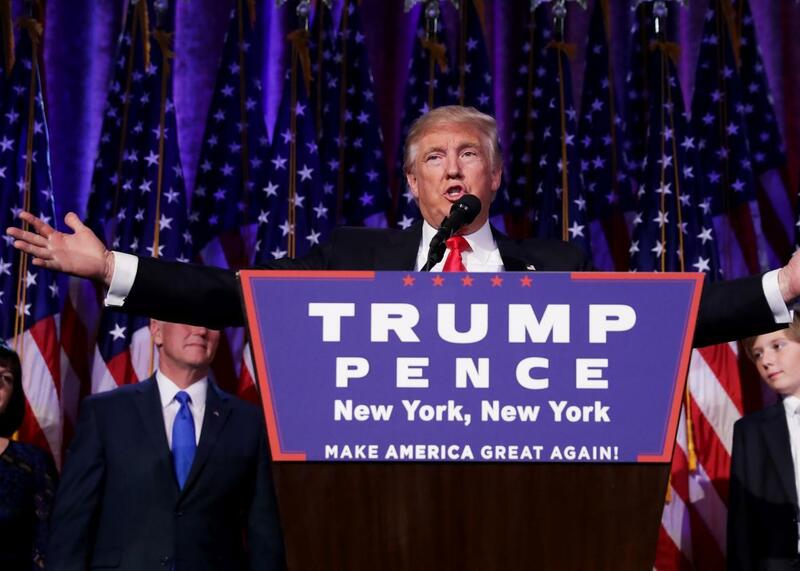 Did Donald Trump Win the Election Because of Trade? A New Study Suggests It Helped. Back in January, I published a post titled, “Could This Map Make Donald Trump President?” Here was the map in question. It was from a paper by economists David Autor, Gordon Hanson, and David Dorn, and it showed the extent to which industries in different parts of the country were exposed to competition from Chinese companies through 2007. The darker the region, the more vulnerable local manufacturers were to the onslaught of imports that came out of the People’s Republic, particularly after it joined the World Trade Organization. 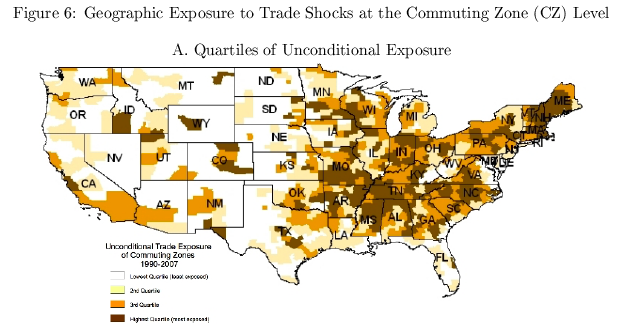 In a series of studies, the authors had shown that trade with China had cost the U.S. far more jobs than previously understood, perhaps as many as 2.4 million, concentrated in factory towns across the country. I figured that if Trump had a path to victory at all—and like most people I was pretty sure he didn’t—it might run through the map’s brown swatches in the Rust Belt, where his rhetoric on trade would play well. The point here isn’t that people in Michigan or Wisconsin cast their ballots for Trump specifically because of his trade stance. It’s that he outperformed his predecessor in places that were more likely to have been ravaged by the effects of globalization. Autor told the Washington Post that he believed that voters weren’t just reacting to “trade policy, per se,” but that disappearing jobs fed into a ”sense of nationalism, the sense that the American way of life is potentially threatened, and that a certain type of employment and a structure that went with that is going extinct.” You could also say that people simply reacted to the growing misery around them—another recent paper found that communities exposed to Chinese competition saw suicide and drug overdose rates rise, particularly among whites. And Trump captured their frustration. Still, this is some of the first rigorous work that tries to examine the link between trade and Trump’s victory, which makes it useful. A previous paper, released during the campaign, found that Trump support wasn’t related at all with China’s effects on local industry. But that work was based on Gallup data, and polls didn’t exactly do a hot job calling the Midwest this cycle. In general, I don’t like monocausal explanations of Trump’s win. Race obviously played a role. So did a sense of declining prospects. A lot of Americans were obviously angry about vanishing factory jobs, but in reality that has as much or more to do with automation as offshoring. But at the very least, this new study is a reminder not to discount the role of economics in fueling Trump’s support. Maybe if we hadn’t taken such a laissez faire approach to trade and let such large swaths of the country decay, voters would have been a little less susceptible to demagoguery.